JERUSALEM - Israel's Cabinet became the final party to sign on to the U.N. cease-fire deal Sunday, while Israeli planes blasted Beirut and ground troops battled Hezbollah in south Lebanon seeking to batter the militant Islamic group in the hours before fighting stopped. Hezbollah hit back with its heaviest rocket barrage of the war on northern Israel. The guns were supposed to fall silent at 8 a.m. (1 a.m. EDT) Monday, according to the United Nations, ending a month of combat that has killed more than 900 people. But implementation of the hard-won agreement already was in question Sunday night when the Lebanese Cabinet indefinitely postponed a crucial meeting dealing with plans to send 15,000 soldiers to police Hezbollah's stronghold in southern Lebanon. Lebanese media reported that the Cabinet, which approved the cease-fire plan unanimously Saturday, was sharply divided over demands that Hezbollah surrender its weapons in the south. That disagreement was believed to have led to the cancellation of Sunday's meeting. Lebanese leaders made no public comments. The deployment of the Lebanese army along Israel's border, with an equal number of U.N. peacekeepers, was a cornerstone of the cease-fire resolution passed Friday by the U.N. Security Council. The forces are supposed to keep Hezbollah fighters out of an 18-mile-wide zone between the border and Lebanon's Litani River. In the final hours before the planned start of the cease-fire, fighting escalated dramatically. Some 30,000 Israeli soldiers fought fierce battles with guerrillas in Lebanon's south. A day after 24 of its soldiers were killed, Israel's army said five died in the latest fighting. Hezbollah reported one of its fighters killed, but did not say when. Israeli jets pounded a Hezbollah stronghold in south Beirut with at least 23 missiles, most coming in a two-minute period Sunday. An Associated Press photographer who reached the area saw the body of a child being removed from the wreckage. TV pictures showed heavy damage appearing to stretch for several hundred yards in all directions in the neighborhood of medium-rise apartment buildings. Israeli planes struck the area again late Sunday, Lebanese security officials said, but no damage was immediately reported. Two Israeli air raids on a village in Lebanon's eastern Bekaa Valley later killed at least seven people and wounded nearly two dozen, civil defense official Ali Shukur said. The strikes destroyed three houses in the village of Brital, about nine miles from the Hezbollah stronghold of Baalbek, and more people were feared trapped under the rubble, he said. Residents said one of the homes housed a Hezbollah office. A raid on the same village last week left seven people dead and wounded nearly two dozen people. 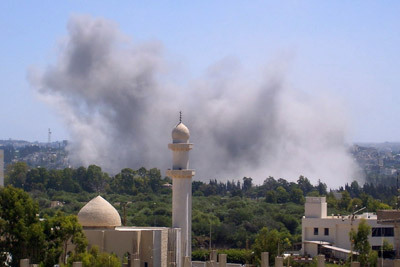 Jets also attacked gas stations in the southern port city of Tyre. The strikes killed at least 15 people, Lebanese officials said. Hezbollah fired more than 250 rockets at northern Israel, the worst daily barrage since fighting started July 12. Missiles killed an Israeli man and wounded 53 people, rescue officials said. Cars were set afire in the northern city of Haifa, billowing black smoke into the sky. Israeli officials appealed to residents of the north who fled the rockets not to return before the government determined the situation was safe. As the fighting persisted, Israel's Cabinet held a stormy debate on the cease-fire, with minister Ophir Pines-Paz criticizing the government's decision to expand its ground offensive ahead of the truce. The Cabinet eventually approved the agreement 24-0, with one abstention. Prime Minister Ehud Olmert said the cease-fire agreement would ensure that "Hezbollah won't continue to exist as a state within a state." In addition to authorizing the beefed-up international force in southern Lebanon, the Security Council resolution calls for the Lebanese government to be the only armed force in the country, meaning Hezbollah would have to be disarmed. Israeli Foreign Minister Tzipi Livni said the agreement, if implemented, "will lead to a significant change in the rules of the game in Lebanon." "I'm not naive. ... I live in the Middle East, and I know that sometimes not every decision is implemented. I'm aware of the difficulties. Yet with this I say with full confidence that the Security Council decision is good for Israel," she said. Officials said Israeli troops would begin leaving southern Lebanon as soon as the Lebanese army and the international force started to deploy in the area. The Lebanese government approved the U.N. plan Saturday, and Hezbollah leader Hassan Nasrallah signaled acceptance. But Hezbollah has resisted previous calls to disarm and its refusal to follow through this time would threaten the deal. The fighting erupted July 12 when Hezbollah guerrillas attacked an army patrol inside Israel, killing three soldiers and capturing two others. Five more Israelis were killed later in the day trying to rescue their comrades. Israel then launched an air and ground offensive, and 4 1/2 weeks of combat has killed at least 789 people in Lebanon ¡ª mostly civilians_ and 152 Israelis, including 113 soldiers. Among the dead soldiers this weekend was Staff Sgt. Uri Grossman, the 20-year-old son of renowned Israeli novelist and peace activist David Grossman. He was killed by an anti-tank missile Saturday, the army said Sunday. Livni said Israel would not stop trying to win the captured soldiers' release, but would not accept a link between their freedom and Hezbollah's demands that Israel free Lebanese prisoners. With Israeli troops remaining in south Lebanon for the time being, the potential for more clashes after a cease-fire was high. Israel's weekend push to the Litani River meant dozens of Hezbollah fighters were caught behind Israeli lines and some of them were almost certain to attack. Military officials said they would not sit passively if that happened. "If we're fired upon, or if Israel's fired upon, then we'll act against the fire," said Maj. Gen. Benny Gantz, the head of Israel's ground forces. "You can't move from black to white easily ¡ª there will be a period of gray." Nasrallah, Hezbollah's leader, said Saturday that his guerrillas would abide by the cease-fire resolution, but warned it was "our natural right" to fight any Israeli troops remaining in Lebanon. Israeli politicians criticized the government's handling of the fighting and its claims of success. Dovish lawmaker Yossi Beilin and hawkish legislator Benny Elon both called Sunday for the creation of a commission of inquiry after the fighting ended. While Defense Minister Amir Peretz said Israel had emerged victorious, the U.N. plan was seen by many Israelis as at best a draw with Hezbollah. Some felt Israel ¡ª unable to subdue a guerrilla force ¡ª had lost. The deal could buy a period of calm, though many worry that more fighting is sure to come. Neither the Lebanese army nor U.N. forces can be counted on to challenge Hezbollah and prevent the Iran-supplied guerrillas from rearming, military experts and commentators said. Amos Yadlin, head of Israel's military intelligence, told the Cabinet that the capability of the Lebanese government was unclear and Hezbollah was sure to continue to get arms from Syria and Iran, according to Israel's Channel Two TV. "Hezbollah has been weakened but not beaten," Channel Two quoted him as telling the meeting. "The chance of a future conflict with Hezbollah is very high." But Livni said the cease-fire should "lead in the end to the disarming of Hezbollah."